NBA Youngboy is a whole mess. The 19-year-old rapper was arrested in Atlanta and chraged with three misdemeanors: possession of weed (less than an ounce), use of fighting words and physical obstruction with another. His bond hasn't been set yet, but he's expected to go before a judge this morning before he's released from the Atlanta City Detention Center. So here's how he allegedly got locked up...again. Apparently, the "No Mentions" rapper - who is the father of 4 children with at LEAST 3 baby's mothers who thinks his & his sometimes girlfriend's Herpes situations are fun and games - was up to no good, squatting in a hotel room that was supposed to be vacant with a female "friend" named Starr Thigpen (above). It's unclear if she is one of his kids' mothers. According to TMZ, housekeeping came to the room and found them hanging out. 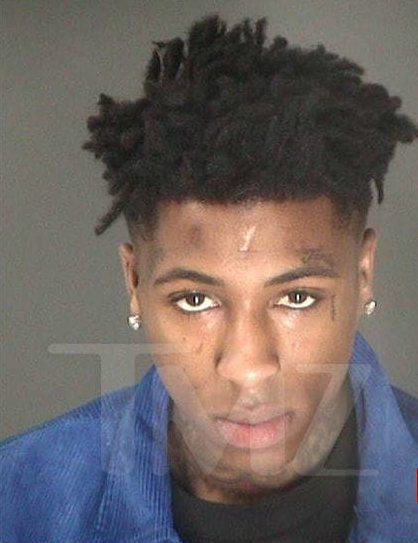 It's reported NBA Youngboy told Starr to "get them out" and that's when she allegedly hit one of the maids in the face. Sheesh. Luckily, the maid was able to get away and call the police. When they got to the scene, the rapper and his friend were arrested. You'll recall, NBA Youngboy was arrested on a kidnapping warrant in 2018. The arrest occurred after surveillance footage of the rapper slamming his girlfriend/baby's mother (Jania) on the floor of a hotel hallway in Waycross, Georgia. He faced felony kidnapping charges for it. Meds and therapy really should be talked about more often.